The Brothers Grimm, Jacob and Wilhelm Grimm, were two German academics who collected and published a variety of German folk tales and fairy tales, and were also known for their work in linguistics, relating to how the sounds in words shift over time. The two brothers began collecting the folk tales of Germany in around the year 1807 in response to a wave of awakened interest in these old tales, and the first edition of the collection contained 156 stories. This was comprised of the 1812 publication of 86 tales, entitled Kinder- und Hausmärchen (“Children’s and Household Tales”), and the 1814 publication of 70 tales, entitled ‘1815’. The Folk Tales of Europe are a treasure that many of our folk overlook, often belittling them as at best children’s stories, and at worst condemning them as utter nonsense not worth the paper they are written on. This is a terrible error of judgement, because as many of us will know, such tales often contain the Folk-Wisdom of our ancient ancestors (albeit encoded in allegory), and such wisdom is often said to be far greater than any we possess today in our endless search for ‘knowledge’. One may wonder why our European folk tales would be a reliable source of ancient wisdom, especially when we look at the damage done to the other sources of our lore by the Christian usurpers who recorded it, and in doing so discreetly/obviously warping their true meaning and moral. In taking the Prose Edda of Snorri Sturluson as an example, we know that this was written in a period when Christianity was relatively new to Europe, and the old ways had only recently been ridden into the dirt. Thus the new religion had something to prove, via misinformation and ridicule, to many who still adhered to the ways of their forefathers. However, when we come to the Folk Tales embodied in Grimm’s Fairy Tales of the 19th Century, we find that they were compiled in a time when Christianity was well and truly established in Europe, the age of enlightenment had taken place, and the Church was not seeking to annihilate indigenous folk culture as it was a few centuries previously. Any dissenting ‘heathen’ elements of the European folk had been thoroughly cleansed in the witch-hunts, had they not? Well, such complacency on the part of the Christian scholars and clergy serves us well here, as we shall later find out. Now we come upon two common questions that need to be addressed here. Firstly, some say the folk tales of the Grimm brothers were re-told to them not only by the peasant folk, but also by the middle and aristocratic classes, who were told them by their servants, thus diluting their authenticity. What difference this makes I cannot see, as by the 19th Century the whole population of Germany was well and truly Christian (nominally at least), so all the tales, whether told by the rural country-folk or the town-dweller, will have been recounted by a nominally Christian mouth. Secondly, it is said also that certain parts of the tales were ‘purified’ by the tellers for the Christian ears of the Grimm brothers, but I claim such elements are often obvious and immediately identified and discarded by the discerning reader, as we will explore below. As I mentioned above, we learn that these tales were recorded in a time and region when the ancestral beliefs had been more or less lost in the subconscious. We can therefore deduce that the Church at this time would have considered the folk of Germany well and truly Christianised, and any tales gathered well and truly Christianised too, and thus not a threat. And in many respects this was correct. Yet hold on! Folk such as shaman/seidrfolk, who would have been persecuted in the abominable witch-hunts of Europe, would sometimes remain vilified in such tales, and portrayed as the archetypal ‘wicked witch’ and cast in evil roles. Yet the irony of this is that examples of ‘positive’ shamanic practices (such as healing, as opposed to the so-called ‘negative’ practice of cursing) survived the censorship and were often employed by the heroes and even victims of the ‘witch’, thus preserving evidence of such practices, albeit in written form. I will hopefully be looking into such examples in the later in this series of articles. For this essay, I have selected a couple of tales which I have personally found useful and enlightening (not all the tales are so – many seem to have no moral, impart little wisdom nor reflect any native belief), and for clarity divided these up into relevant categories as far as possible. I hope the reader finds some worth in what I have written, and that it inspires them to look deeper into such tales in the future, if they have not already done so. The key is to have a good imagination about you and keep an open mind at all times, which is vital in helping to identify and analyse the allegories to be found in folklore. In my own opinion, and using the little knowledge of shamanism that I have, this tale would seem to describe in allegory a shamanic journey, at least as I, a non-practitioner, have heard them described. The protagonist in our first tale, The Golden Bird, is the youngest son of a king. The young prince encounters his fetch in the form of a fox, and together they embark upon several trials in which they seek to win various ‘golden’ objects (and we can safely assume this is the gold of deeper spiritual understanding, rather than mundane material gold). We see the fox advising the boy on the best course of action through each of his trials, eventually leading him to happiness and good fortune. This tale begins in the ‘pleasure-garden’ of a king, in which grows a tree bearing ‘golden apples’. The king counts the apples every day, and one morning finds one to be missing. This happens on a number of occasions, much to our good king’s consternation, and he summons his eldest son to watch during the night for the thief. However, his eldest is unable to stay awake throughout the night, and in the morning discovers an apple is missing once again, and is none the wiser for it. The second son suffers a similar fate, and awakens to find yet another apple gone from the tree and cannot explain it. The youngest asks if he may watch, and despite his fathers initial distrust of his third son (this is the first example of the use of the number three in this tale) the young man nonetheless stays the course and discovers that it is a ‘Golden Bird’ taking the apples. The king orders that someone put an end to this thievery, so of course the eldest son demands that it should be he that sets out on this noble quest, to hunt down the Golden Bird. At this point may I say that I believe that this ‘Golden Bird’ represents enlightenment, spiritual evolution, a higher state of being, and the hunting down of this Golden Bird can be seen as pursuing the quest of an Odin Consciousness, as we would call it. When the eldest son comes to the borders of a wood, he meets a fox (his fetch) who offers to help in his search. The foolish prince however scorns the fox as an ignorant animal and dismisses the advice, and ends up getting distracted at an enchanted inn, forgetting forever his noble quest. The second son, sent out by the king after his brother fails to return, also ignores what the fox has to tell him, to his doom also. The third and youngest son however heeds the advice of the fox, and is able to proceed with the quest. However, although he listens to the fox at each trial, he does not always do exactly as the fox says, and this always results in problems. Yet the fox returns to help him out of his trouble each time, because the young prince acknowledges him, and we are told the fox feels compassion for him also (as does our own fetch, if we acknowledge and try to listen to them). “Make yourself quite easy, dear fox; I will do thee no harm.”, said the young prince. In the case of this tale, the fetch of the young prince is a fox, yet as we know, our fetch can take on any number of forms, and we are not just limited to one. The fetch appeared to the young prince, for he was sincere and willing to listen, in order to help him along the path of spiritual evolution, to help him to chase and catch the ‘Golden Bird of Enlightenment.’ And in the end, after all his troubles, we see the young prince succeeding in his quest, and despite being waylaid by his devious brothers on the way home, returns not only with ‘The Golden Bird’, but also a ‘Golden Horse’ and the ‘princess from the Golden Castle’ – three ‘golden’ treasures. It is notable that in this tale we see the use of the number ‘three’ on several occasions: three sons, three challenges and three ‘golden’ prizes, which would seem to indicate that this number was of significance to the Folk from whom this tale evolved. 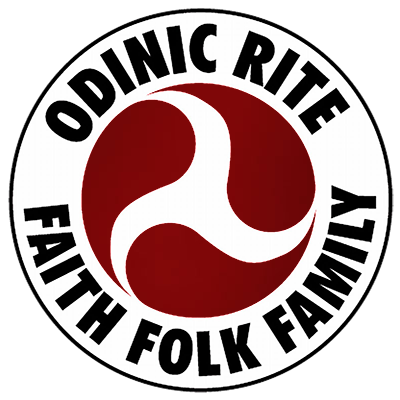 And as we know, three is of course a very important number in our mythology, so this is pattern is of no surprise to us as Odinists. This tale recounts the very type of story mentioned above, as the reader will shortly discover. We begin our tale in the company of a poor servant-maid, who it is said was so neat and industrious that everybody believed that she must have had help from the fairy folk. One day whilst cleaning the porch, she came upon a letter addressed to her, in which she was invited to the ‘Christening’ (well they had to stamp their mark somewhere, didn’t they?) of one of the pixie’s children. No sooner had her master granted her permission to go, than three of these pixies arrived and took her away with them to the mountain (or mound) where they lived. As soon as they arrived, it is said that the mountain opened up to receive them, and as Runic John says in The Book of Seidr, “…I think we can safely say that the opening [up] of the earth, the hills, the stones and mounds is referring to opening up gateways through which [it is possible] to enter into the otherworld…”. As the tale progresses, we are told of the indescribable beauty of the abode of the fairies – perhaps reflecting the inability of those who’ve undertaken such journeys to recount exactly what had happened/the appearance of their hosts and their dwelling. The young maiden was extremely well treated by these good fairies, and they asked her to stay for three days, and so she did. However, when they sent her back through the ‘mountain entrance’ (and thus through the portal back into Midgard), and she had arrived back home, she found that things were a little different as to how she had left them. She was unknown by both the other servants and the master, for though she had passed only three days in the realm of the fairies, no fewer than seven years had passed in Midgard, and her old master had died and the house had been let to strangers! So in this tale not only do we find an example of a Folk-Memory of the existence of ‘fairies/pixies’ and other realms, but we are also warned of the risks of an adventure into such other realms, the disparity in the passing of time between different worlds being one factor. Well that concludes my exploration into Germanic folklore for the present time. What I have written came from my own reflections on reading the tales, I may of course have got some things wrong or misread the meanings, but since all we have is the tales themselves, all we can do is to attempt to understand them. There are a few other tales within the Grimms’ work that I would like to investigate further, so hopefully there will be more to come. I also have Hans Christian Andersen’s Fairy Tales on my bookshelf waiting to be read, plus an old-looking book of English Fairy Tales – so there’s plenty of material around, it’s just finding the time they deserve devoted to their study and enjoyment.